When you explore the mysteries of the universe, don't neglect the floorboards. Last December, BS-Accommodations' Daniel Lee was breaking through the ceiling over the Aspen East kitchen, trying to fix a cracked floor joist that had distorted the floor of the dorm room above, when something dark fell down with the ceiling material. 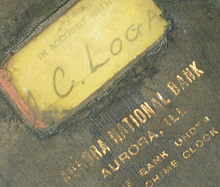 A small black book lay among the rubble, with the words "Aurora National Bank--'The Bank under the Chime Clock'" engraved in faded gold letters on the cover, and the cryptic name "A.C. Logan" peeking through a clear plastic window. The pages were brittle and full of mildew, and Lee could tell just by handling it that it was very old. 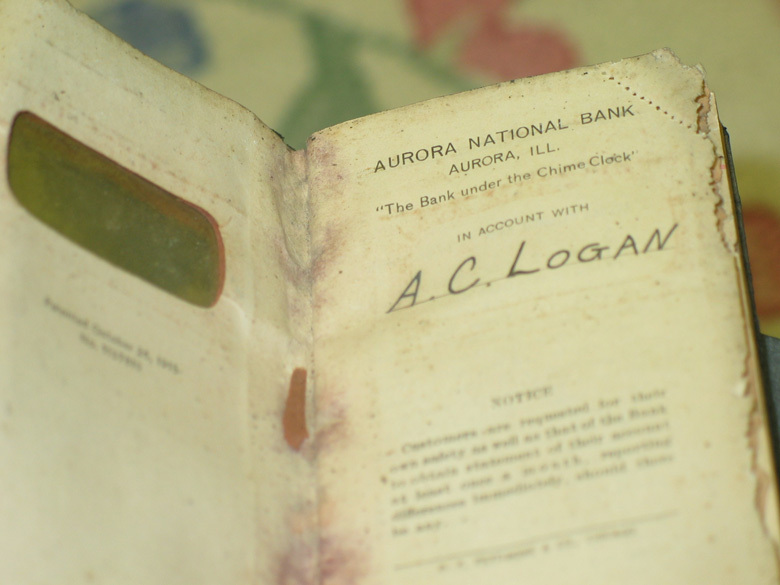 Inside, Lee and Cheryl Bentham of Accomodations found pages of handwritten deposit and credit statements spanning from January 8, 1927 to December 3, 1927. Many of the entries are for hundreds of dollars--the equivalent of thousands of dollars today, according to the Bureau of Labor Statistics. Two entries are for over a thousand dollars, leading people to speculate about why the book would have been lying under the floorboards. 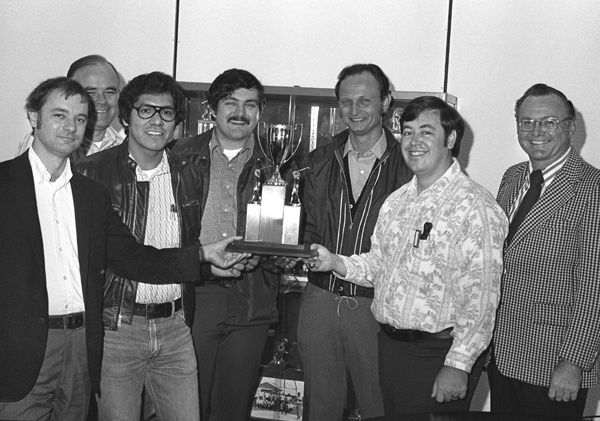 So far Fermilab's history committee has turned up nothing conclusive about the identity of the elusive A.C. Logan. FES Site Service's Sue Populorum has tracked down the headstone of an Arthur C. Logan who died in Aurora in 1938 at the age of 53. She has also unearthed an early Aurora City Directory that lists an Arthur C. Logan who was working as an electrician in 1910-1911. But there is nothing to suggest these individuals are the same person as the book's owner. The book was found in the section of Aspen East that had been moved from Site 57 on Eola Road in 1971. If you have any information about the identity of A.C Logan, you can call us in the Office of Public Affairs at x3351. Tee time's set for noon as Fermilab's golf season ramps up. The first of four summer golf outings will be Friday, June 23, at Blackberry Oaks Golf Course. Whether you enter as a four-person team or as a single looking for a spot on an established team, now is the time to sign up. See Mike Matulik (X4091) or Patrick Liston (X2332) to sign up and pay for your team now. You can find more information--including contests, directions, payment instructions and fees--here. THE tale of Galileo dropping two cannonballs of unequal weights from the Leaning Tower of Pisa laid the cornerstone for a theory that explains the way matter behaves in a gravitational field. Now a test on a far grander scale, involving stars and galaxies, could determine how the unseen mass that makes up dark matter behaves under the influence of the unseen field known as dark energy. Firmly grasp the tick close to the skin and pull it straight out. Avoid - Dave Shemanske of Roads & Grounds suggests avoiding deep woods and tall grasses. Stay on paths and mowed surfaces. Cover - Co-worker Steve Whiteaker advises covering up your skin as much as possible. Tuck pants into socks, and long-sleeve shirt into pants. Wear light colors to spot ticks easily. Repel - Dave added that repellents help, especially for exposed skin and where ticks can enter clothing. Use DEET for skin and permethrin on clothes. Remove - Use sticky tape for unattached ticks. Embedded ticks should be removed ASAP since the infection risk increases with duration of attachment. Karen Swanson of the Medical Department recommends the use of tweezers. Grasp firmly as close to the skin as possible and gently but firmly pull the tick straight out. Make sure you get all the mouthparts. Wash with soap and water. If you want help, the Medical Department is available to assist. Starting today, you may view your benefit information online. The new feature allows you to review your benefit selections and dependent/beneficiary information. You may access Employee Self Service via the Laboratory Services Section web site. Window washing inside Wilson Hall began today, starting from the top of the building and working down over the course of the week. Floors 12-15 will be washed on today, 9-11 on Tuesday, 7 and 8 on Wednesday, 4-6 on Thursday and 1-3 on Friday. If you wish to have the full interior of windows in your area washed, it is your responsibility to clear the area ahead of time. Washers will not move furniture to clean the windows. Scottish Country Dancing will meet Tuesday, June 13, in Ramsey Auditorium in Wilson Hall. Instruction begins at 7:30 p.m. and newcomers are always welcome. Most dances are fully taught and walked through, and you do not need to come with a partner. Dancing will continue in the Auditorium through the summer. Info at 630-840-8194 or 630-584-0825 or folkdance@fnal.gov.